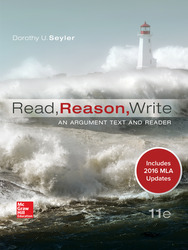 Read, Reason, Write unites instruction in critical reading and analysis, argument, and research strategies with a rich collection of readings that provide both practice for these skills and new ideas and insights for readers. Read, Reason, Write is committed to showing students how reading, analytic, argumentative, and research skills are interrelated and how these skills combine to develop each student's critical thinking ability. Active Reading: Use Your Mind! What Type—or Genre—of Source Is It? What Kind of Audience Does the Author Anticipate? What Are the Author’s Sources of Information? Firoozeh Dumas, "The F Word"
What Will My Audience Know about My Topic? Where Does My Audience Stand on the Issue? How Should I Speak to My Audience? What Type (Genre) of Argument Am I Preparing? Will the Rogerian or Conciliatory Approach Work for Me? Neil de Grasse Tyson, "Things People Say"
Jonathan Swift, "A Modest Proposal"
What Type of Paper Am I Preparing? How Can I Select a Good Topic? What Kinds of Topics Should I Avoid? Katherine Ellison, “What’s Up, Doc? A Bloody Outrage, That's What"
Donald Yee, "Show Them the Money"
Ruth Marcus, "Privilege Unchecked in the U-Va. Case?" Richard Kalenberg, "5 Myths about Who Gets into College"
Chapter 20 THE ENVIRONMENT: HOW DO WE SUSTAIN IT? Kate Chopin, "The Story of an Hour"
Summary of "The Story of an Hour"
Christopher Marlowe, "The Passionate Shepherd to His Love"
Sir Walter Raleigh, "The Nymph's Reply to the Shepherd"
A.E. Housman, "Is My Team Ploughing"
Ursula K. Le Guin, "The Ones Who Walk Away from Omelas"